Hollstein (1949-, XLVI: 167, no. 1301); Musiek & Grafiek, Antwerp (1994: 5, fig. 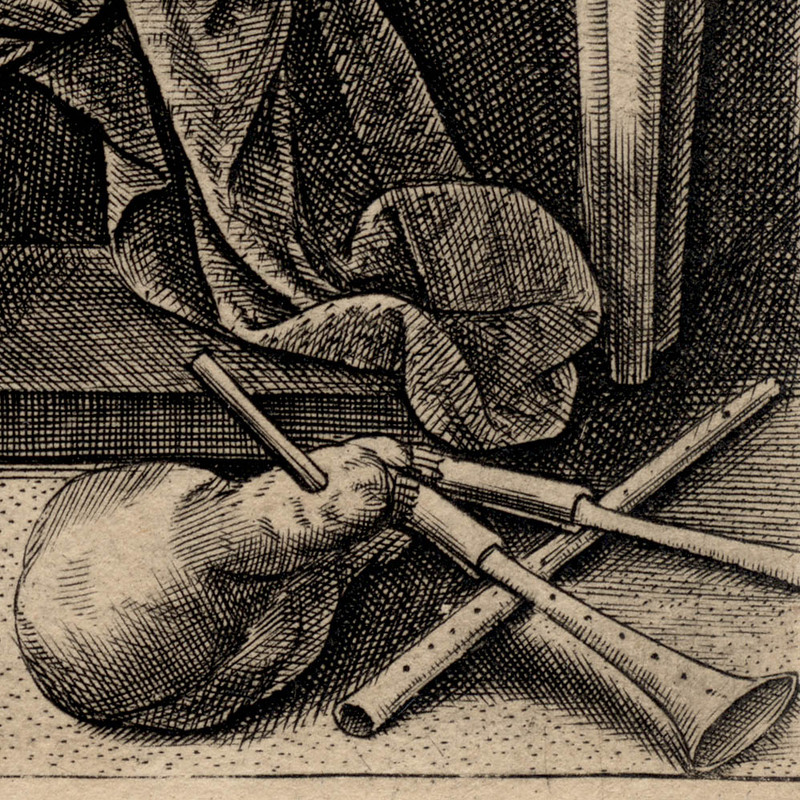 3d); Paris RIdIM (2000); Rasmussen (2002, Bagpipe; 2007, Flute). Condition: strong and well-printed impression with tread margins. The sheet has aged to a mellow yellow and there are remnants of mounting hinges (verso) and a faint stain at the top left corner (recto). 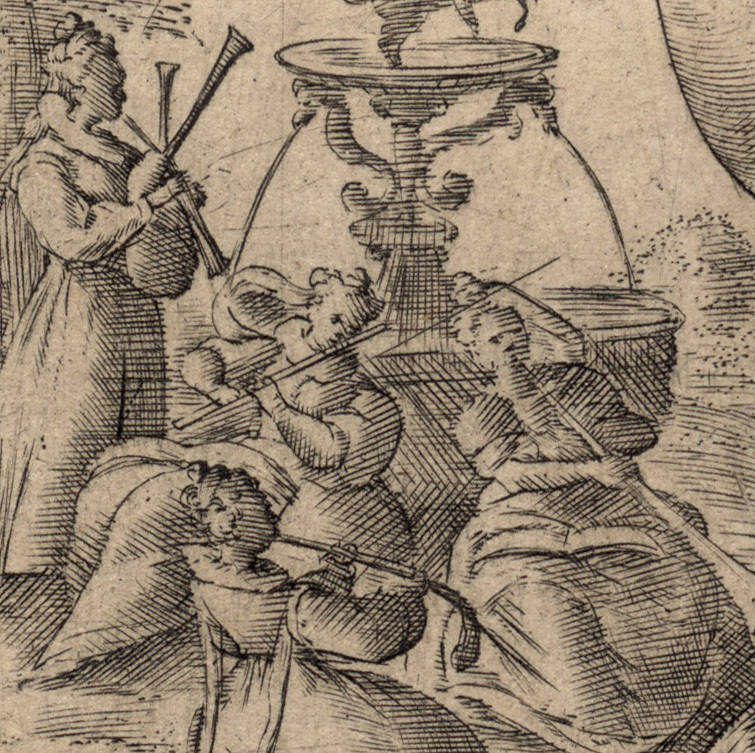 I am selling this rare early engraving of the muse of music portrayed with around a dozen musical instruments, including an early bagpipe in the foreground and—extraordinarily—a woman playing one in the distance, for the total cost of AU$142 (currently US$102.32/EUR97.89/GBP83.28 at the time of this listing) including postage and handling to anywhere in the world. If you are interested in purchasing this rare and historically significant print showing a large collection of early musical instruments, please contact me (oz_jim@printsandprinciples.com) and I will send you a PayPal invoice to make the payment easy. 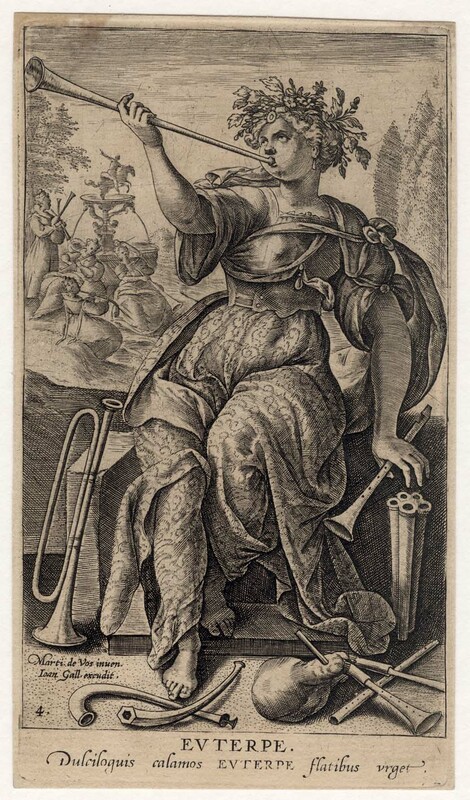 This image of the muse, Euterpe (the daughter of Zeus and Mnemosyne), leaves no doubt that she is in charge of music in the sense that I counted no fewer than twelve musical instruments surrounding her. Sadly, lyric poetry that should have been another of Euterpe’s symbolic attributes is strangely missing. 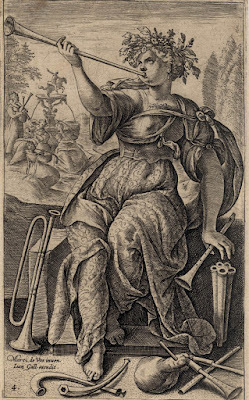 Like many early 17th century images this print has the usual trappings of mannerism; for example, note how Euterpe’s left arm is almost detached from her shoulder and how delicately small her neck seems. 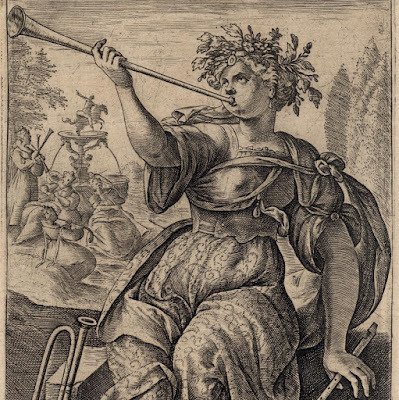 What I find very interesting about the manneristic swirl to Euterpe’s gown is how well it helps to project the notion of sound of the straight trumpet that she blows. 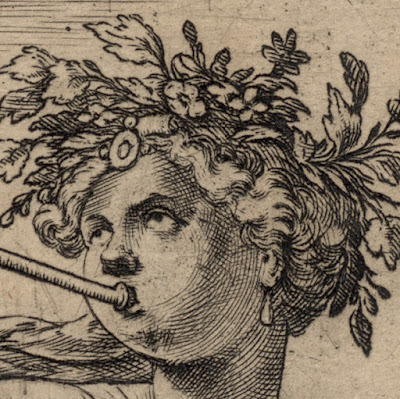 Regarding the musical instruments surrounding her, my eye is drawn to the bagpipe shown in the foreground—curiously still inflated. Of course, bagpipes were not invented by the Scots and so to see one here is not an issue. The development of this instrument involved a much wider spread of countries from Africa to the Balkans and beyond. I should also mention that this beautiful engraving with its featured bagpipe is not the first print to depict this instrument. One of the most famous representations of a bagpipe is Durer’s engraving, “The Bagpiper” (1514), but, for me, what makes this scene with the bagpipe so special and perhaps unique is that it shows in the distance a lady playing one. 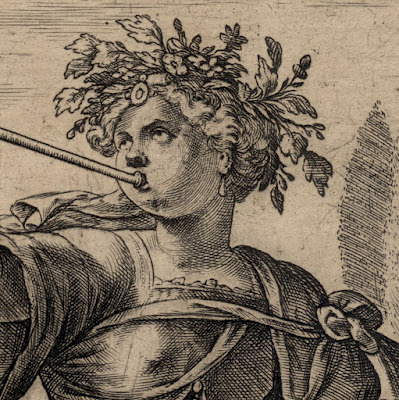 Perhaps I should not be surprised, as I fully appreciate that there are no physical impediments to a woman playing a bagpipe, but from my understanding of the use of bagpipes in the early days is that it carried with it notions of bawdiness—the bawdiness of Chaucer’s “The Canterbury Tales”. Perhaps more disturbing, is that this instrument carried with it symbolic notions of the male genitalia. 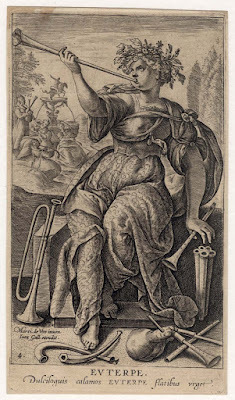 I should hasten to add, however, that this symbolism was usually reserved for still life arrangements featuring a bagpipe placed beside a vase—the vase in this setting symbolised feminine charm.